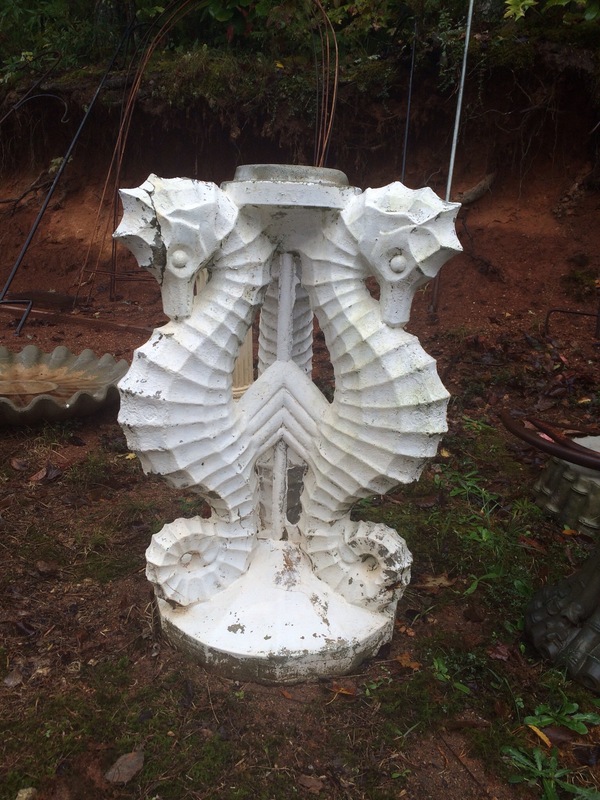 It was a rainy Friday, when my friend Susan called to say I needed to get on over to Woodruff for an estate sale. She saw some doors I might like. I forget what I was doing at the time, but I know I dropped it all, threw some tarps in the back of my car and headed out. 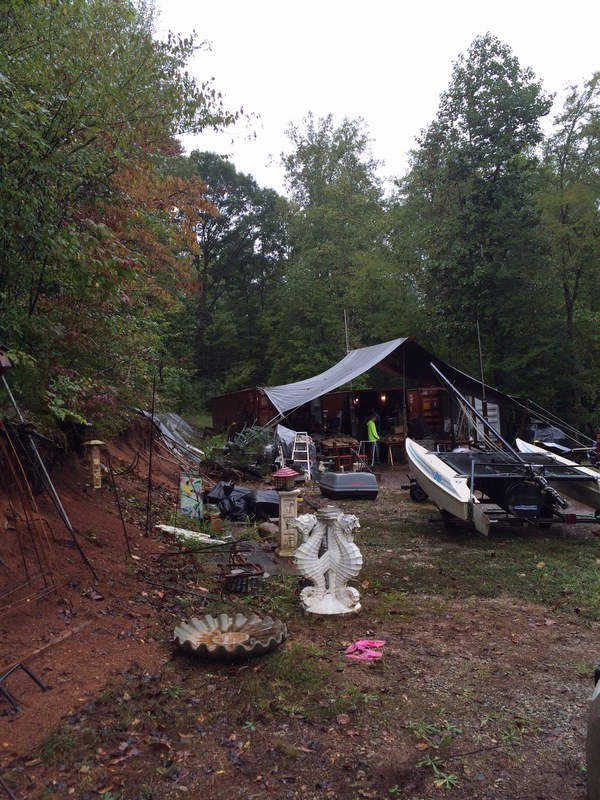 This was not an ordinary estate sale, where the homeowners have passed away and the entire contents house is up for sale. 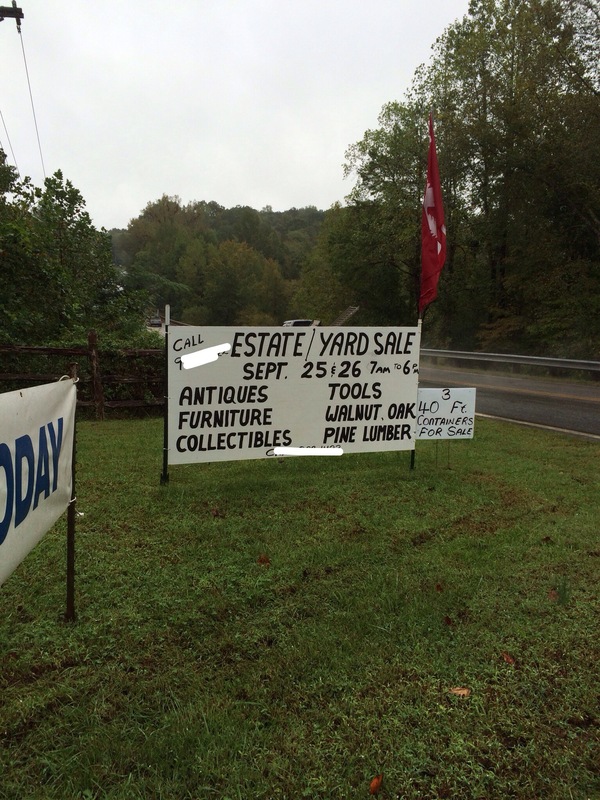 This sale was at the home of an auctioneer. He had 40 foot containers filled with stuff, barns filled with stuff and a yard filled with stuff. It was raining. 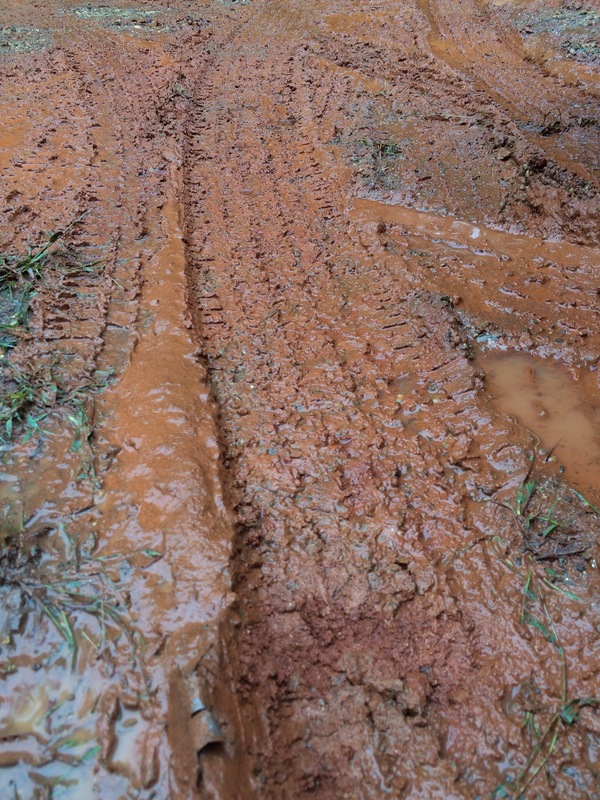 It was muddy. And it was so much fun! 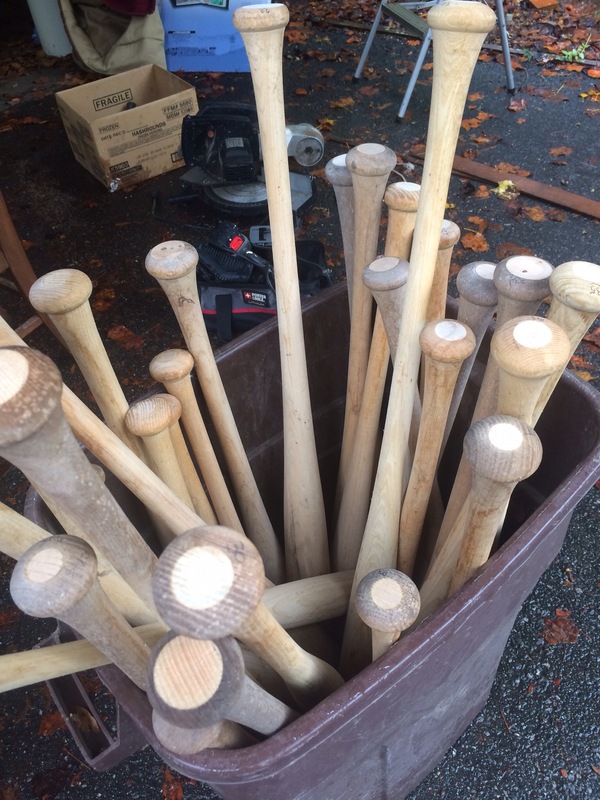 He had buckets of baseball bats for less than a dollar a piece. 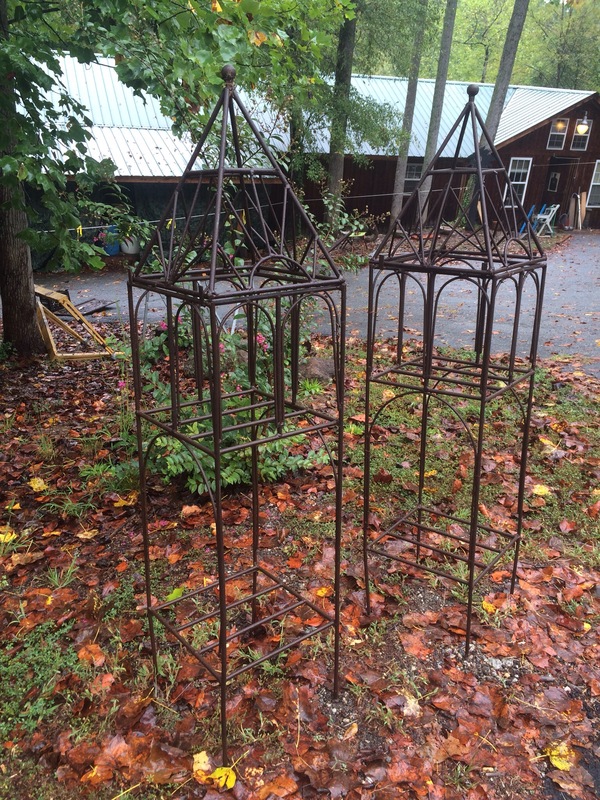 He had wrought iron plant stands, $10 a piece. I thought they would look great in my yard, but then I remembered that I’ve been killing plants lately. They stayed. 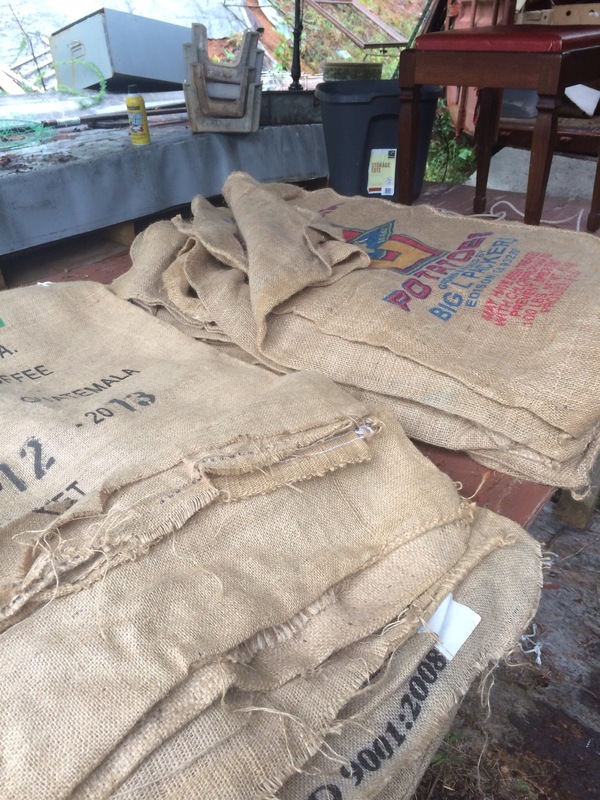 He had 50 lb burlap coffee bags. I took home five of these babies! 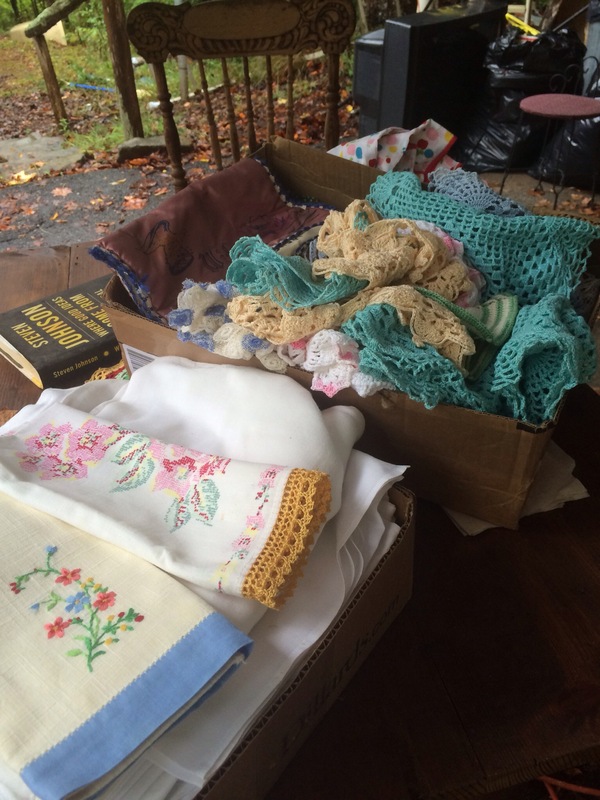 I picked out two tablecloths and some lace that I thought I could sew into some bags. 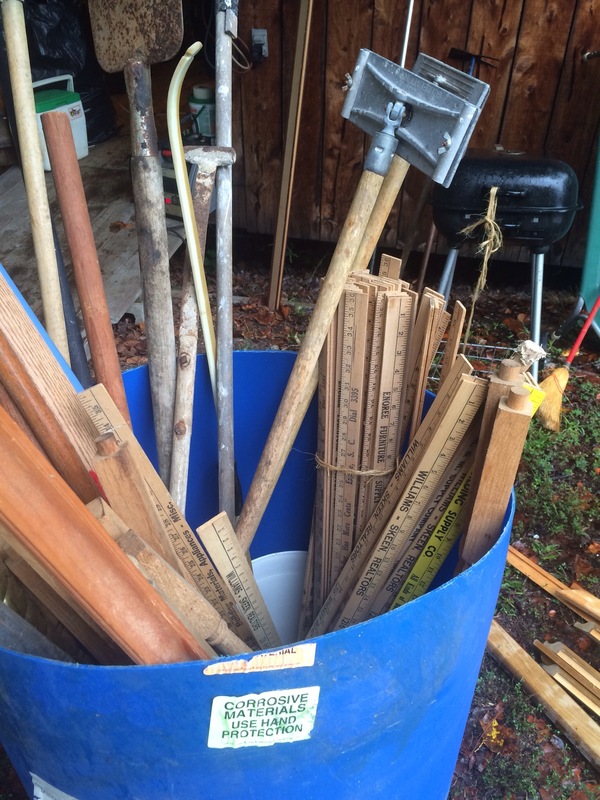 Don’t ask me why, but I bought all of those yard sticks for $3! What will I do with them, you ask? I have no idea. 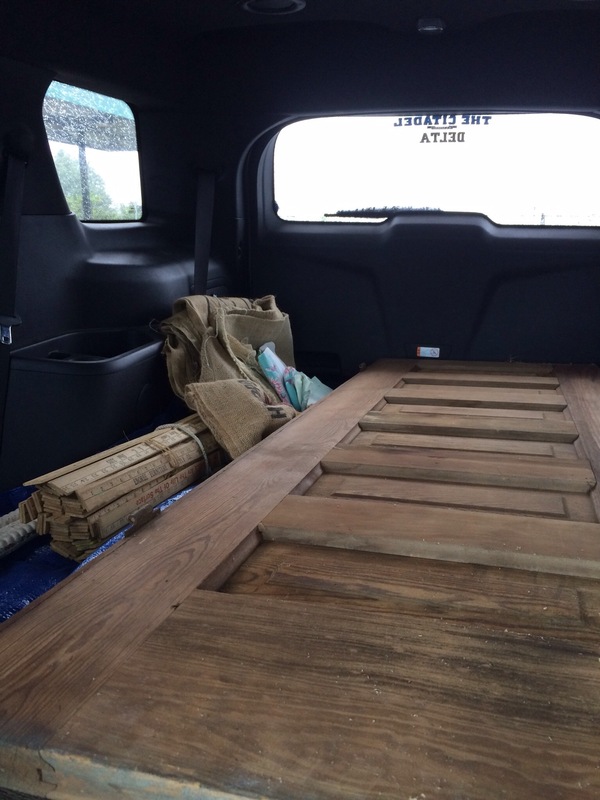 And my biggest find of the day were hundred year old doors for $5 a piece! I know…Crazy! So for less than $50 I came home with some fun and interesting stuff. 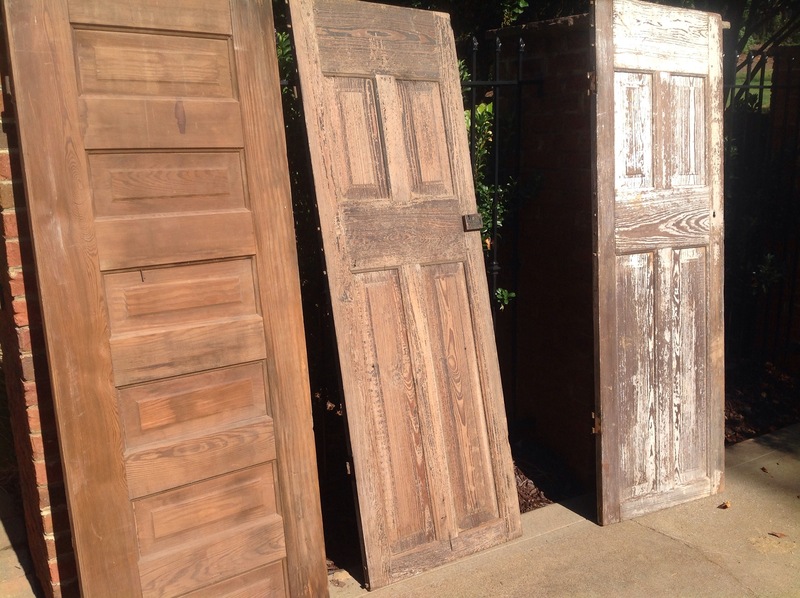 These are the three doors in the sunshine. Aren’t they beautiful? After doing some measuring, I will only need two of the three. I’m sure I will find a fun use for the third. I had to have this one, just for the lock. 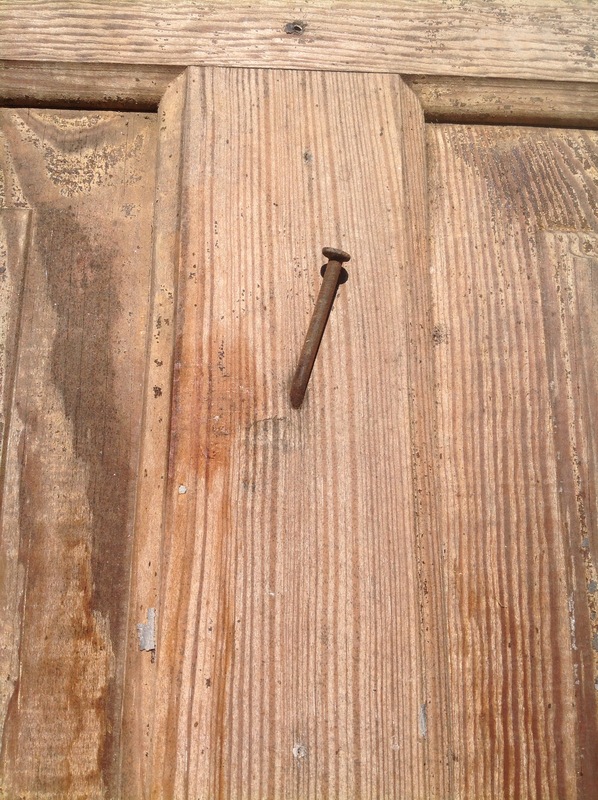 I wonder what the family hung on this nail. A night shirt? A dress? Maybe a hat? 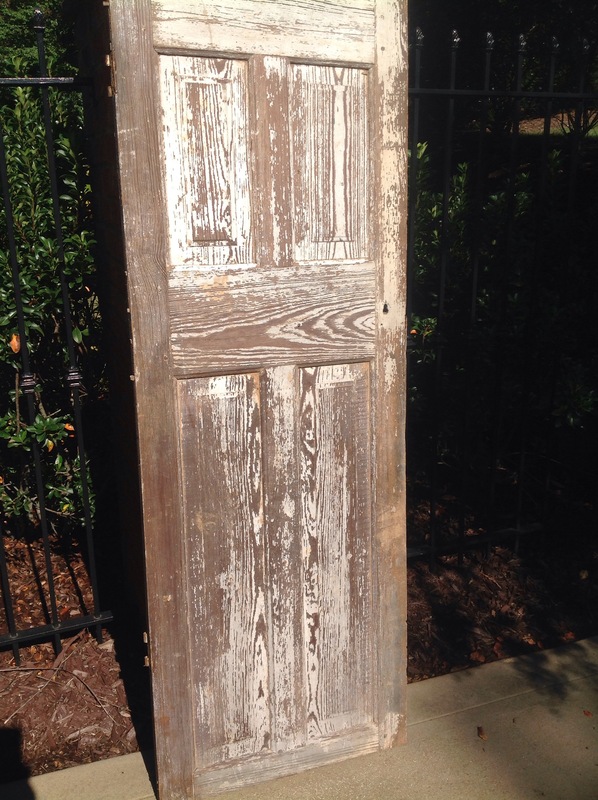 I loved the distressed white paint on this beauty. But when I turned her around…Wowza! 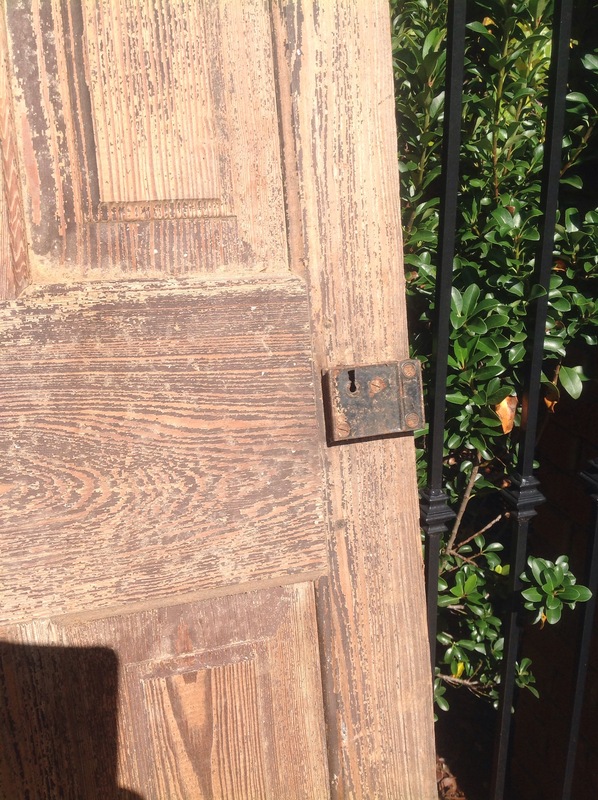 Check out the lock! And the two colors of paint! Inside the panels is a yellow color and the framework is red. On top of that is some flaking grey paint. I love it! I don’t want to change a thing. So here they are friends! I think they look fantastic as his headboard. I turned them upside down so the locks would be visible. Thomas wanted his bed in the corner to give him more floor space, but the commercial headboard I originally bought would not fit in this space. Well, I do believe this is a much better solution. 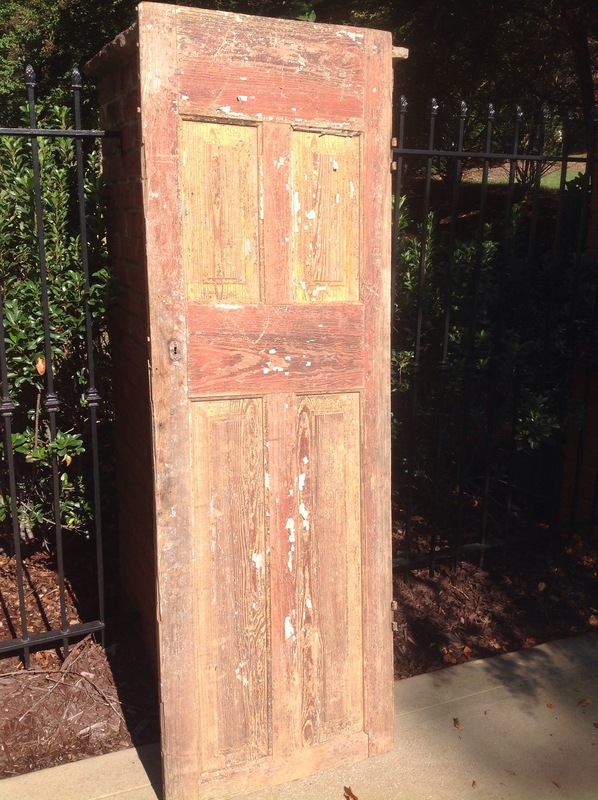 Posted on October 12, 2015 by mary •	This entry was posted in Home and tagged estate sale, headboard, old doors. Bookmark the permalink. You really hit the jackpot with this sale! 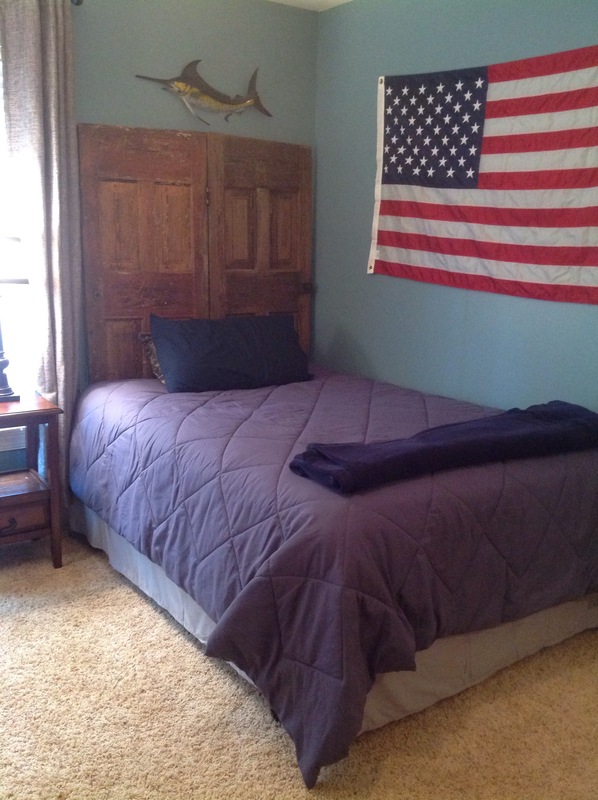 The “headboard” looks great.